Last year, JD Group’s AGT (Automatic Gear Transmission System) e-bike won the Gold Award for Design and Innovation at Eurobike. This year, their sleek, attractive electric folding bike is also enjoying attention. Last year, JD Group’s AGT (Automatic Gear Transmission System) e-bike won the Gold Award for Design and Innovation at Eurobike. This year, their sleek, attractive electric folding bike is also enjoying attention. Creating a ‘folding bike’ as a logical extension to their TranzX PST e-bike range, JD has achieved a versatile and extremely compact solution to assist modern mobility. The Energy Kit configuration is ideal for folding bikes. Unlike other e-bike battery packs, the battery in the TranzX PST Energy Kit fits under the carrier and behind the seat post – ideally suited to the folding bike construction. The design of this new configuration is intended to offer well-balanced, light weight riding comfort and an attractive, progressive appearance. JD’s individual solution approach is a natural for OEMs. With optimum grasp of both these specialized power and folding technologies, the makers of TranzX PST have united two advanced systems to provide the ideal basis for efficient e-bike folding engineering. JD has positioned itself well in this niche segment, with more OEM clients expected to add electric supported folding bicycles in their 2013 programs. At the Taipei Cycle Show Dahon, took a different approach, incorporating a TranzX PST system with the battery pack in the carrier to launch their new electric folder. The “Ikon Electric”, an aesthetically pleasing folding e-bike solution, proved to be a powerful attention-grabber at the company’s booth. 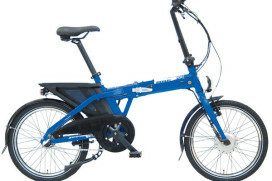 The TranzX PST Folding Bike complete e-bike is a versatile and ultra-compact two-wheeler. Its easy-folding mechanism has it ready to ride in seconds. Designed and engineered for minimum space requirements, the battery pack is fitted behind the seat tube, providing top performance in a most compact construction. The TranzX PST Folding Bike complete e-bike is a versatile and ultra-compact two-wheeler. Its easy-folding mechanism has it ready to ride in seconds. Designed and engineered for minimum space requirements, the battery pack is fitted behind the seat tube, providing top performance in a most compact construction. The 36V 6.6Ah Li-Ion rechargeable battery provides powerful support for distances up to 40 kilometers. Other components can be equipped for individual OEM. The 250 Watt hub motor is available for front as well as rear wheels, and the gear system can be either hub or derailleur (3 or 7 speeds). Many display options and brake systems are available. When folded, the TranzX PST e-folder measures approximately 74 x 79 x 37cm (H / L / W), easily fitting in the trunk of small cars. The overall weight is 19.8 kg.